BERRIEN SPRINGS, Mich. --- A crowd of several thousand Andrews University students, staff, faculty and alumni gathered around what used to be the school's Johnson Gymnasium this morning. University spokesperson Beaty Nekst explained to local media that the Andrews family had "come together to show their gratitude for the complete and utter destruction of Johnson gym by targeted tornado damage before dawn this morning." Staring at the rubble many in the crowd spoke of not being able to believe the good news when they heard it. "I have to admit that I was losing faith in the prospect of that eyesore of a building being torn down," said visiting Loma Linda resident and faithful Andrews alumn, Edith Greenley. 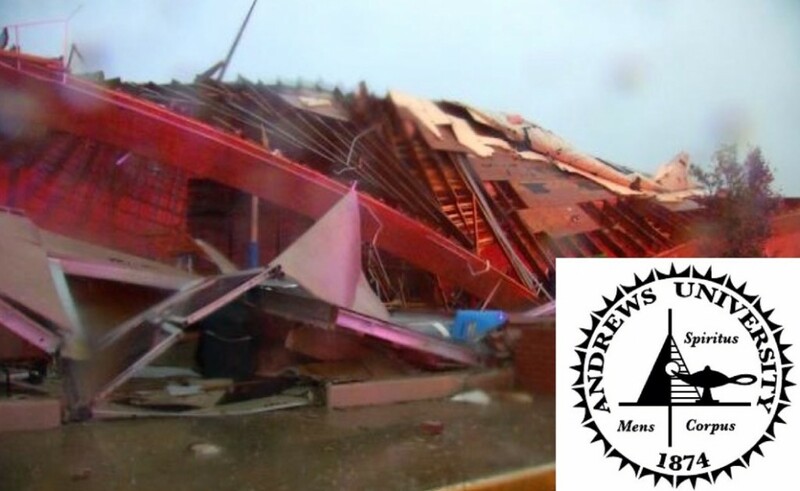 Nekst said that although Andrews administrators were relieved that the early-morning destruction had not incurred human casualties, they shared Greenley's sentiment. "As far as we know, Johnson gym was the ugliest building in Adventism," said Nekst. "No longer will we have to re-route campus tours to avoid this side of campus." Nekst added that Andrews administrators were hoping "a hefty insurance payout will do what university fundraising has yet to achieve: pay for the much-anticipated Health and Wellness Center." It was nice to hear from our friend, the visiting Loma Linda centenarian Edith Greenley. She really gets around in her old age. Her story is my all-time favorite on BarelyAdventist. I grew up in Berrien Springs and attended Andrews University for a few semesters, so I can understand how this is humorous to many folks aquatinted with the university and the plans for a new fitness center. Having moved to Brazil and adjusted to a much less expensive way of life, I laugh with a tinge of guilt. Every day when I go out I see at least twenty homeless people, dead dogs on the side of the road. There is the mall for the fortunate few who can afford to shop there. There is also the cheap mall where mall filled with sub-quality items for the majority. There are men and women selling candy on the bus to feed their kids. My husband and I have been approached by homeless parents as we were going into the drugstore who asked us if we could buy diapers or cold medications… They are kicked out by security when they don’t have enough money. All this to say, if Johnson Gym was built in my city, people would think a piece of heaven had descended among them. Even the oldest, ugliest buildings at Andrews give many educational facilities here a run for their money! I was supposed to be a finalist to replace the president of Andrews University. Now that I know about the tornadoes, I’ve decided to stick with my backup plan to become a hip-hop artist after I lose the primary elections and get booted out of the GOP Convention. This new kind of hip-hop will be a gentler, sleepier type of rap.